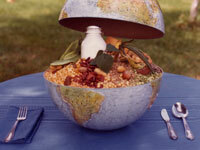 Frances Moore Lappé shows how to practice vegetarianism and address world hunger. There is tremendous waste of edible protein involved in producing America's meat-centered diet, while much of the world goes hungry. 1. The Nutrition of Protein - What is protein? Why do we need it? How can we get it? 2. The Ecological Cost of Meat Protein - Feedlots as protein factories in reverse. Europe and the US as protein drains. 3. Cooking with Complementary Proteins - Preparation of dishes that exemplify the three main combinations of non-meat foods which produce high quality protein. "The only film we know that encourages Americans to consume more vegetables and less meat...It would be an excellent stimulus for discussion in college courses or at professional meetings. At the high school level, it would be useful in conjunction with consumer education, biology, and health courses." "A timely discussion of world hunger, with substantial information on good nutrition." "Perhaps its major statement is made by showing that 18 million pounds of vegetable protein are wasted in the US yearly through conversion to meat...This deficit of 18 million pounds is approximately that required by the Third World."